During the C19 there were two large Ship Agents operating in Falmouth: Fox’s and Broad’s. They acted as agents for the many ships calling into Falmouth, especially those calling for orders, and acted as Consuls for many different countries. In this article, Bartlett Volunteer Linda Batchelor looks into origins of Broad & Sons and traces the later family. The town and the port continued to develop throughout the 1700s with the establishment of banks, schools and a public dispensary, a new Custom House and the growth of the Packet service and the seaborne trade. It was described by Daniel Defoe as ‘by much the richest and best trading town in this country’[*] with the emergence of a strong and influential merchant group. 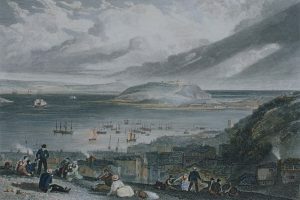 In 1801 the population had risen to just under five thousand and Falmouth was one of the foremost ports in England. It was here that William Broad chose to set up a home and a business as a shipping agent and merchant on his retirement from the sea in 1808. 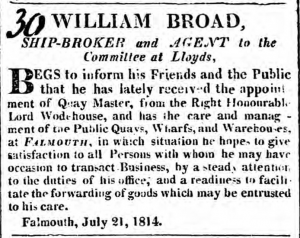 William Broad, the founder of Broad & Co, was born in 1772 and raised in the vicinity of Penzance where in the latter part of the 18th century there were a number of Broads who were established in trade and as ship owners. In 1794 he married Jane Richards at Madron near Penzance and they had several sons and daughters, some of the children born in Penzance and others in Truro and Falmouth. Copy in the Tony Pawlyn collection, by permission of the late R. L. Broad, Esq. 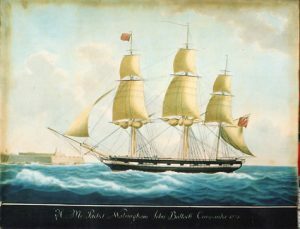 William was educated at Truro Grammar School and his early career began at sea attaining command of modest merchant vessels working out of Penzance. The first Penzance Shipping Register (1786 -1823) [*] records William Broad as master of several small vessels, the Salcombe, a 32 ton sloop in 1793 and the Joanna, a 59 ton sloop in 1795, both employed in the general coastal trade. From October 1795 William was the master of the Spackman, a much larger Brigantine of 101 tons. Originally built in 1764 as one of the tin ships conveying tin ingots from Cornwall to London, by 1794 she had been released from that trade and was regularly employed in carrying salt cured pilchards to Italy and returning with olive oil and dried fruit from the middle east. William became a member of the Levant Company [*] and then master of vessels sailing from Truro and Falmouth. These mercantile vessels were mainly involved in trade with the Mediterranean and the Middle East and also with the West Indies in what was a period of war and unrest. In such hostile times English vessels were open to attack from French and Spanish privateers and for security these valuable mercantile fleets often sailed under Royal Navy convoy. William’s last commands as master of such ships were the Pelican and the Phoenix of Truro. In 1803 the Pelican on homeward passage from Smyrna was captured by a French privateer and taken to Sfax near Tunis. What happened to Captain Broad and his crew is uncertain but in October 1804 the Pelican was sent from Sfax to Constantinople and was recaptured by the British and taken to Malta. 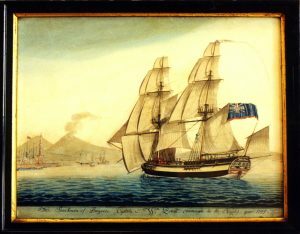 [*] By 1806 Captain Broad was in command of the Phoenix sailing in Royal Navy convoy in the Mediterranean with Commander Robert Pettet of HMS Termagant. At the conclusion of the voyage the commander sent the following letter to the Company of Merchants at Lloyd’s. Having received the greatest assistance from Capt. William Broad, of the Phoenix, Symrna ship, during my passage from that place to Malta, and from thence to Gibralter; I consider it a duty I owe to that gentleman to state to you the very great exertions he used during the whole of that passage, not only by answering and repeating promptly my signals, but by taking such vessels of the convoy in tow that at any time happened to be sternmost. At this point William quitted the sea and by 1809 had established William Broad & Co, Ships Agent and merchants in Falmouth. 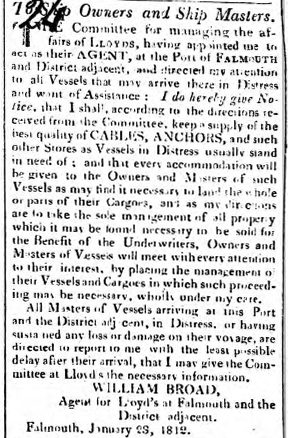 The precise date of establishment is not certain but the company was acting as general agents and importers by late 1809 as evidenced by an early advertisement in the Royal Cornwall Gazette[*] of December 16th 1809 for the sale of casks of Zante currants ‘of the finest quality and in prime order’. With William as head of the company the firm prospered and expanded. As well as acting as shipping agents the company was also appointed to other marine agencies, provided services such as marine surveying and valuations and operated as importers and general dealers in many commodities, especially wines and spirits. As the family grew and William’s sons entered the business, subsequently the firm was titled William Broad & Son and ultimately as William Broad & Sons. Initially the family would have lived and worked in some of the same premises but ultimately family members began to move further away from the work place. The second generation and beyond of Broads moved to the growing residential areas of Falmouth, such as Woodlane Terrace, away from the commercial heart of the town. In some cases Broad family members lived and worked abroad, for example in Mexico and Brazil, for periods of time. In 1811 William Broad & Co were appointed as agents and marine surveyors for Lloyd’s at Falmouth. [*] Lloyd’s had begun to deal with maritime insurance in the 1730s. 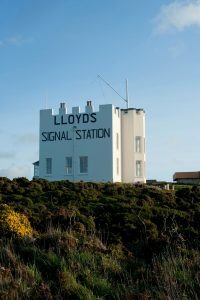 Over the periods of the American Revolution and the Napoleonic Wars the need for such insurance became vitally important and Lloyd’s became dominant in shipping insurance. As shipping agents, merchants and as Lloyd’s agent at Falmouth, Broad & Co had close involvement with undertaking valuations and damage assessment of ships, especially ships of the Packet Service. An example of William Broad’s role in this respect concerns the temporary packet Little Catherine. [*] At the end of 1812 William had carried out a survey of inspection of the ship together with Mr Henry Williams, a Post Office employee at Falmouth. A series of letters, held in the Post Office Archive, between Christopher Saverland (the Packet Agent at Falmouth) and Francis Freeling (the Secretary of the Post Office) illustrate William’s close subsequent involvement with damage assessment and valuation of the ship over the next two years. [*] Broad & Co also often acted as selling agents for the sale of ships, including some packet ships and the Broad family were also part owners of several packets. As an example by a sale advert dated 29th March 1814, William Broad appears to have been one of the five proprietors of the Speedy, a temporary packet on the Falmouth Station. Over time the Company also represented the Marine Insurance Company of New York and Paris and for many years they provided consular services for various countries such as Sicily, Latvia and the Netherlands. They also became agents for the Droits of Admiralty. In English law this refers to customary rights and perquisites belonging to the crown. They include rights regarding flotsam and jetsam, treasure and ligan (goods or wreckage on the seabed attached to a buoy and thus recoverable). Also all ships seized at sea and salvage and all sturgeons, whales and porpoises. The revenue from the droits originally belonged to the Lord High Admiral but now belong to the crown for public purposes and are paid into the Exchequer. Broad & Co were therefore responsible for dealing with such matters in the port and surrounding sea. William was head of the firm and presided over the business until his retirement. On his death at his home in Arwenack Street in 1853 he passed on a valuable legacy to the next generations of his family. [*] Not only was he a successful merchant and closely involved in a wide scope of maritime matters but he had also became prominent in the life of Falmouth. Three of William’s sons Robert Richards, William Richards and Alfred Richards joined the family firm and remained living and working in Falmouth although Alfred left the partnership in 1844. [*] William’s daughters Emma and Elizabeth also grew up and were married in Falmouth although both ultimately left the town to settle elsewhere. Robert Richards Broad was born in Penzance and baptised there on 21st June 1797. He subsequently joined his father and his brothers in the family firm. In the 1851 Census he is described as a Justice of the Peace and a Consular Agent and in the 1871 Census as a retired Wine Merchant. He was also Mayor of Falmouth for terms in 1841, 1845 and 1862. [*] During his career he received two orders of foreign knighthood, one from Holland for his services as vice consul for the Netherlands and the other from Saxony for services rendered to the Saxon government. He married in Falmouth in 1822 to Nancy Tippet Turner (Nanny) who was born in 1796 in Penryn. They lived first on the Bar and then at Lower Brook Street and later at Woodlane Terrace and they had at least eight children. William Richards Broad was baptised in Penzance on the 25th November 1799. By 1809 he was living with the family in Falmouth and later he too became part of the family firm of shipping agents and merchants. He was also actively involved in local life. He was commissioned as a second lieutenant in the Pendennis Artillery Regiment of Local Militia in 181626 and he served as a councillor and on various civic bodies. In 1825 he was married at Long Ashton, Somerset to Charlotte Rossiter who was born in 1804 in St Thomas, Jamaica. They lived in Falmouth on the Bar and Harbour Terrace and had a large family. William Richards died in 1850. Shortly after his death his widow took her family to London where she lived for the rest of her life. The youngest son of William and Jane Broad, Alfred Richards Broad was born in Falmouth about 1809 at the time of the establishment of Broad & Co. Like his older brothers he joined the Broad partnership where he worked for some years. He married in 1837, Ellen Southwell Courtis from Plymouth and they were living in Woodlane Terrace where five of their six children were born. In 1844, however, Alfred withdrew from the partnership and moved to Plymouth where he established himself as a wine merchant. Ellen died in 1851 and sometime later Alfred re-married and another three children were born. Alfred died in Plymouth in 1879. His three surviving sons remained in the wine trade. William and Jane also had daughters, Emma born in Truro in 1802 and Elizabeth born in Penzance in 1807 who were both married in Falmouth in 1831 and in 1829 respectively. Emma’s husband, James Hooton was from a Falmouth family. A John Hooton is listed in the Pigot’s directory of 1830 in the High Street Falmouth as a Merchant and agent for Albion Life Insurance[*] and James Hooton is also described as a ‘Merchant’ in documentation. Their first two children were born in Falmouth but their daughter Elizabeth Mattiana (Matiana) was born in 1836 in Mexico. Presumably James was there on business and Emma had accompanied him. By the 1841 Census Emma and James were living in Lambeth, Surrey and were still there in 1851. Elizabeth married Robert White in 1829 in Falmouth although Robert was born in Aylesbury, Bucks. He was a solicitor at the time of the marriage and subsequently was the Registrar for Falmouth and the Clerk of the County Court in Falmouth. [*] He left that position in 1851. The family seems to have emigrated to the USA by 1853, first to Albany, New York where Robert is described as a Book Agent and subsequently to Detroit where he became a Rail Road Clerk and the entire family appear to have remained in the USA. Despite the fact that some members of the immediate family left Falmouth the family continued to figure prominently in the town. Various members of the family were also active in many aspects of life in Falmouth. Some were Poor Law Commissioners, sat as magistrates and on various committees and were members of local societies. In 1870 The Falmouth Harbour Commissioners was set up by the Falmouth Harbour Order 1870 to administer Falmouth Bay, Carrick Roads, Cross Roads, and the inner harbour and the Penryn River. Robert Richards Broad (Junior), grandson of William and son of Robert Richards Broad (Senior), was appointed as the first Chairman of the Harbour Commissioners. The family was also closely involved with the establishment and continuing administration of Falmouth Docks,[*] in bringing the railway to Falmouth[*] and were investors in the local mining industry. The firm of Broad & Sons first established at the beginning of the nineteenth century continued as a major presence in the town trading until well into the twentieth century. Individual members of the family were prominent in both the commercial and social life of Falmouth over the generations and the Broad family could truly be said to have made a great contribution to the town and particularly to the maritime history of Falmouth. Defoe Daniel, A Tour Thro’ The Whole Island of Great Briton 1724-1727 Vol 1, Ed Pat Rogers, Penguin. Gardner Victoria E.M., The Business of News, Palgrave Macmillan, 2016. Gay Susan, Old Falmouth, Headley Bros, London, 1903. Kirkham Graeme M.A, Cornwall and Scilly Urban Survey- Falmouth HES Report No 2005R003, 2005. Pawlyn Tony, The Falmouth Packets, Truran, Truro,2003. Woodfin R.J., The Cornwall Railway to its centenary in 1959, Bradford Barton, Truro, 1972. Newspaper Archives – The London Gazette, The Times, The Royal Cornwall Gazette, The West Briton, The Western Luminary.